I've seen this image multiple times thrown around in social media. 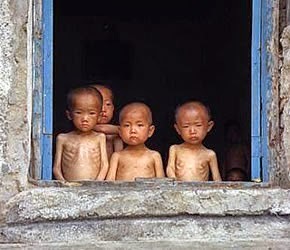 It purportedly shows malnourished kids in North Korea. I could not find a reputable source for this image using Google image search, only blogs. Is this image truly showing North Korean kids? What is the original source for it? This photo was taken during the 1997 famine in North Korea by Justin Kilcullen, director of the Irish Catholic charity Trócaire. The Irish delegation met a member of North Korea's ruling Workers' Party Central Committee and two vice-ministers, said Mr Kilcullen. They raised issues of human rights, arms sales and economic policies. Trocaire last month shipped its first consignment of aid to North Korea, 3,750 tonnes of rice which has arrived from Vietnam. Thanks in part to international support, the famine ended in 1998. According to numerous international organizations, North Korean living standards have improved significantly since 1998. Not the answer you're looking for? Browse other questions tagged photography north-korea . Is Queen Elizabeth queuing for a sandwich in this photo? Is this a real photo of Australia?